Please use Booking page to book wooden house, room or place in the camping. It is the most simple and most convinient form of the booking. You can use phone, Skype and e-mail listed above to book too, however we ask you to use its only if you can not made booking using our site. Our latitude and longitude coordinates: 51°51'25.6"N, 104°51'31.8"E (see the marker at Google Maps). A car or a taxi on the good highway - the Baikal path (about 1 hour). 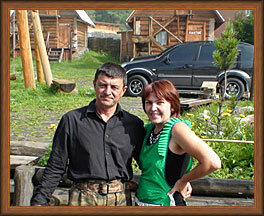 Transfer from the airport or railway station in Irkutsk can be arranged. Regular bus service (1h 40m) or minibus service (1h 15m) from Irkutsk bus station, to get off at the bus stop "Krestovka" - it is walking distance not more 70 meters up the hill. By boat along Irkutsk water basin and Baikal lake from Raketa pier in Irkutsk to Listvjanka pier. 1 km from the pier to the Derevenka hotel. Port Baikal is the settlement located on opposite from Listvjanka coast of Angara river. There is station of Round-Baikal Railroad in settlement. The excursion trains plying on Round-Baikal Railroad from Irkutsk, and the local train sent from Slyudyanka station of the Transsiberian railway arrive to port Baikal. The port Baikal is connected with Listvjanka a ferry which operates the year round. In Listvjanka the ferry arrives to pier on Rogatka cape (near by Baikal museum, distance to Derevenka hotel - 2,5km). See pages Listvjanka and Interactive Map of Listvjanka for more details. The Irkutsk area is located in time zone where the difference between local and Moscow time makes +5 hours. Please, take into account local time at planning your travel and phone calls in the hotel.